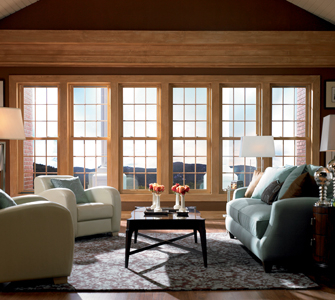 For your home, one of the best options could be Chester and Delaware County picture windows. At Windows Plus we know just how stunning this type of window can be for the home. Keep in mind, your windows and doors are the only features of your home that can be seen from both inside and outside. That means they impact both the interior and exterior aesthetics. From the interior, this style of window gives you wide views of your great outdoors and allows in plenty of natural lighting. From the outside of the home, you will be able to see in to the details inside your home. Just be sure that this will be a wise choice, from both angles. Also, keep in mind that this will not allow for much privacy so plan accordingly. These windows cannot be opened either so make sure you plan other areas for windows that are not fixed if you tend to like fresh air and ventilation. There are several advantages and not many disadvantages when it comes to picture windows, but they are something you should be aware of. The cost is lower, compared to other styles of windows, due partly to the fact that there are no working mechanisms and even just replacement glass is affordable. It all basically comes down to how large an area you want your picture window to cover. The natural light and stunning views are worth it. That is, as long as your have a view worth framing as the focal point of the inside of your home, like a framed picture. Heat gain is one of those traits that can be a plus or a minus. In the winter, this is an added bonus. Yet, in the summer this can be something that takes extra work to keep cool so this is something you should take into consideration. The only other really concern is the lack of ventilation. If you are ready to move forward with your project, then give us a call. At Windows Plus we know what it takes to get the job done and look forward to taking on new projects for new clients. We take great pride in the work that we do and it shows in the results we deliver to our customers. Let's meet up so we can discuss the variety of options you have and help make the best choice for your home. For all of your Chester and Delaware County replacement windows and other related services, trust the Windows Plus name.